Performance reviews, when done properly, can be an amazing tool to align your employees around their goals. Unfortunately, most companies don’t do them properly. Managers are busy, so they fall into the trap of either only focusing on recent events (this is called the recency bias), or they’ll use ranking systems that are unfair to most employees (especially top performers). That’s why so many companies have started to get rid of them. Deloitte, Accenture, Gap, GE, Microsoft, and many others have scrapped the annual review in favour of “frequent check-ins”. This is a smart idea in theory because they weren’t working, and if that’s all they were doing, that’s simply not enough. But the truth is, they’re great. Performance reviews should be one small part of your entire performance management process. Performance reviews are one of many tools available for managers to engage, motivate, and retain their employees. They have different tools for different situations, and they need to know when to use which tool. Kudos to the companies that switched from annual reviews to more frequent check-ins, but it’s not necessary to get rid of them. At a high level, here is how you should use each feedback tool you have. We’ll go into more detail throughout the post. Monthly one-on-ones: Remember, one-on-ones aren’t supposed to focus on performance. Use this time to see how employees are feeling. Quarterly team performance: We learned very quickly that team goals (we use OKRs) are better than individual goals. It allows us to align as a team. Set quarterly goals and monitor the performance as a team. Annual performance review: This is where you can use data from the whole year to talk about an employee’s performance and help them with career goals. Real-time feedback: An important thing to keep in mind is in addition to these feedback tools, you should give employees feedback in as near real-time as possible. Now that you understand which point in the process you should be using performance reviews, let’s look at a few examples of how to make them work. One thing that Google does really well is the emphasis they place on peer reviews. One great thing that Zappos does with their performance reviews is that they tie them to their core values. 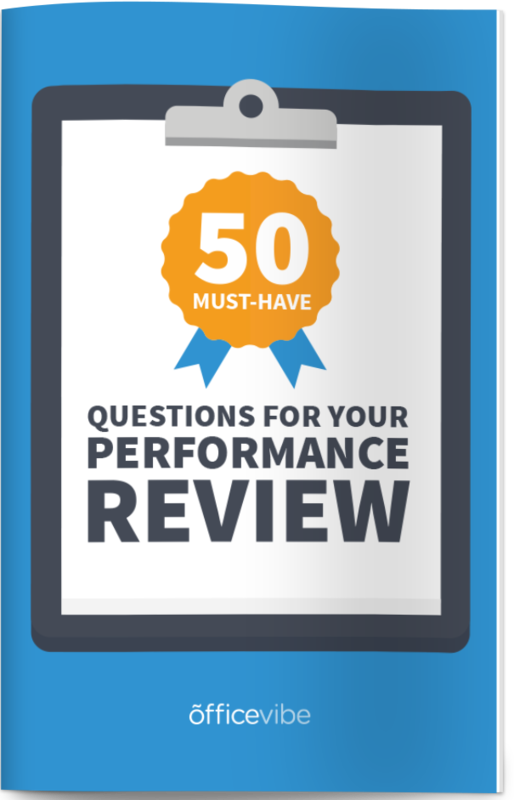 Free Bonus: Get these 50 performance review questions you can use in your next review. Here are a few helpful tips for you to keep in mind as you’re structuring your review. Here are a few steps to follow to make each review successful. One of the biggest problems with performance reviews is that they’re not based on data, which makes biases or personal opinions come into play. If you set clear goals from the beginning of the year, you’ll be able to accurately and fairly measure performance. If you and an employee agree on goals, they’re less likely to challenge any negative feedback because it was made clear what you both would be measuring. Annual performance reviews can be incredibly nerve-racking for employees so it’s important that you calm their fears. Start the meeting on a positive note, let them know that it’s their meeting, and that you’re there to help them grow in their career. If you can set the tone early on in the meeting, you’ll be much better off. Use the goals you set, milestones they’ve achieved, reviews from other coworkers, and as many different data points as you possibly can to get a more accurate picture. The more sources of data you use, the less chance you have of bias getting in the way of the review. Together, with the employee, create an action plan that you both can agree on for what to improve for the following year. A good tip to keep in mind is to find out what the employee’s career goals and plans are to make sure you help them. The annual review is the perfect time to have those career growth discussions. Important: Make sure you provide any support necessary for them to achieve the items on the action plan. Take notes of everything you’re discussing during the meeting, and at the end of the meeting, make sure to follow up with the employee by email to ensure everyone is on the same page. One important thing to keep in mind when giving feedback during your review, is to focus on behaviours and not personality traits. Behaviours can be changed, whereas personality traits are harder to change. With that said, here are a few examples of phrases you can use in your next performance review. Performance reviews work, there’s no need to get rid of them. Build a culture of trust, and you’ll have amazing reviews. Just like Google and Zappos, use peer reviews and tie performance to core values to make them even stronger. Take notes throughout the year, and use as much data as you can to avoid biases. Focus on behaviours instead of personality traits. Work with employees to constantly improve. Make sure they understand that you’re there to make them better, and the review is just one part of that process.